The design. This is something you should agonize over and research a bit yourself, even if you are hiring someone. You need to think about what you want from your kitchen – the feel and the function…. marry the 2 together. The people at gardenweb have this nailed down. 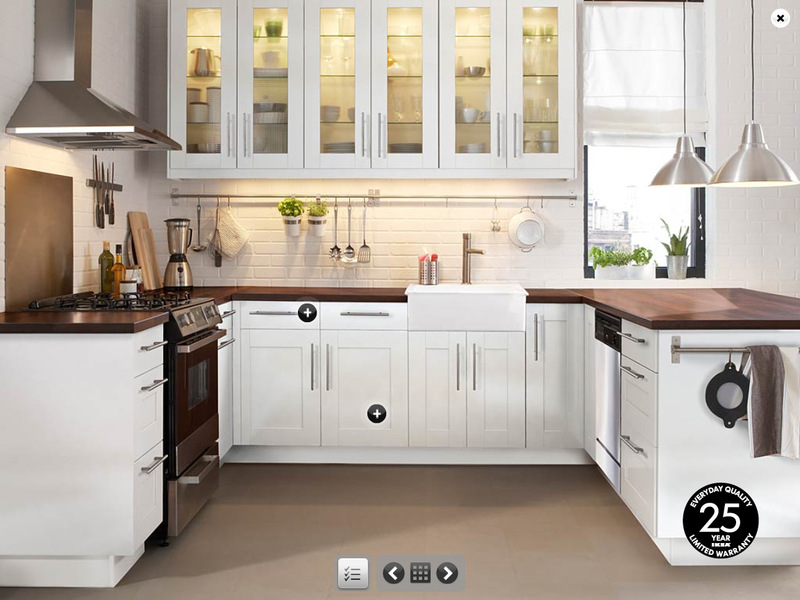 Look for their ‘Read Me If You’re New To GW Kitchens!’. It makes you think and can help you with your game plan. You want to know where things go first, not figure out where they go when you have a new kitchen. I want something bright and airy with vintage touches and modern convenience. Timeless to me and the most sustainable/green products I can afford. I need a proper pantry where I can reach everything, assemble shopping lists and unload groceries quickly. I need a baking area and storage for my spice collection so none gets buried. We were gifted lovely dishes, they should be seen. I need a prep, landing and clean up space with room for when people want drinks without getting in my way. I cook atleast 5 days a week only for 2 people but I bake for an army. I like ethnic food and want to cook more of it, I need real ventilation. It needs to be comfortable for me to move around, soft on my feet, plenty of light and inspirational. It’s where I can get away from it all. I envision taking dishes through the pass through and putting above the dishwasher or in one side of the sink. I’ll prep to the right of the sink – plenty of space for everything and within arms reach of the left set of drawers. As soon as I find a vintage buffet table, we’ll be making a coffee and baking station (also where a microwave must go) with some cabinets or open shelving above. We’ll build a small bar area outside the kitchen to keep people out which is great because the fridge is out of the main area. 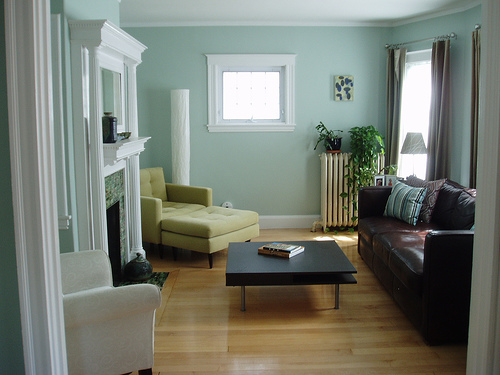 Paint: Benjamin Moore “Palladian Blue” in formula Aura Matte – Aura is a low-voc paint. I went with Matte instead of the Bath/Kitchen version since we have wavy plaster walls and it’s just as durable (after a 2 week cure). We have used it in the rest of our house and I LOVE it. You load your brush, roll once and move along. You don’t paint along with Tom whitewashing the fence. In an hour, you can add a second coat! If you are doing it by yourself, by the time you cut in and put paint up, you are really ready to start again! I do think it’s worth the $54 or so price tag. 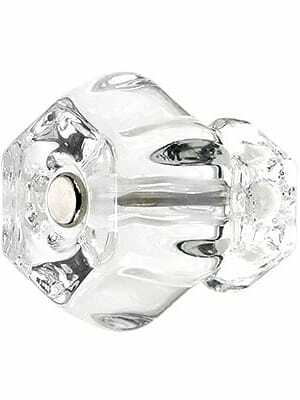 Faucet: Grohe Bridgeford with water saving technology in Chrome (cause they sell one that isn’t) Grohe is a high end faucet with ceramic faucet cartridge which is suppose to be excellent. I wanted a forever faucet with water saving technology. I saved the most money by going with chrome instead of another finish (upgraded finish usually starts at $250). I don’t think anyone but me will notice. If I got a stainless sink farm, I would have gone with the upgrade. Sink: Ikea Domsjo – double bowl 36″ farm style. My LOVE sink is a Rohl Shaw 36″ fireclay white apron sink with no division but at $1200 +/-, it wasn’t going to happen. We would have also spent a lot more on our countertop. Counter: DuPont Zodiac Quartz in ‘Meteor Gray’ – I wanted quartz because I didn’t want to deal with sealing marble or granite, the whole radon component is not something I’m comfortable with and neither is a material that is found in the US usually. Quartz is local, green and no maintenance for the same price. Sounds like a no brainer. Cabinets: Ikea Lidingo with a beveled subway tile backsplash – subway is classic and stands the test of time. I can change my accessories and paint a lot easier than changing out a current or modern style backsplash. Paul still wants me to consider something glass – we’ll see! Ikea Vinna – this was a compromise. I wanted Varde handles but Paul thought they were too chunky. They aren’t too modern. Flooring: Forbo Marmoleum Click in Raven and Volcanic Ash for a checkerboard pattern. Marmoleum is a brand name for Linoleum. Why marmoleum? I love that it’s easy to clean (no grout, no grout sealing, not hard on the back like tile) It’s also a green material with the only downside that isn’t made here in the United States although the distributor is in good ‘ol Hazelton, PA. Vinyl wasn’t a consideration even thought it’s much cheaper – Vinyl softens overtime while Linoelum hardens and is more resistant to heat. It also has an average life of 40 years. You get more for your money the longer you have it. Range Hood: Ikea Luftig – I really wanted something more high-end with noise reduction and lots of venting but that was *gulp* $2k+ maybe someday after we hit the lottery. It’s not as loud as I expected so I’m very happy. We need a fan in our kitchen since it will be a while before we put in central air. It isn’t pretty but we surely need it! 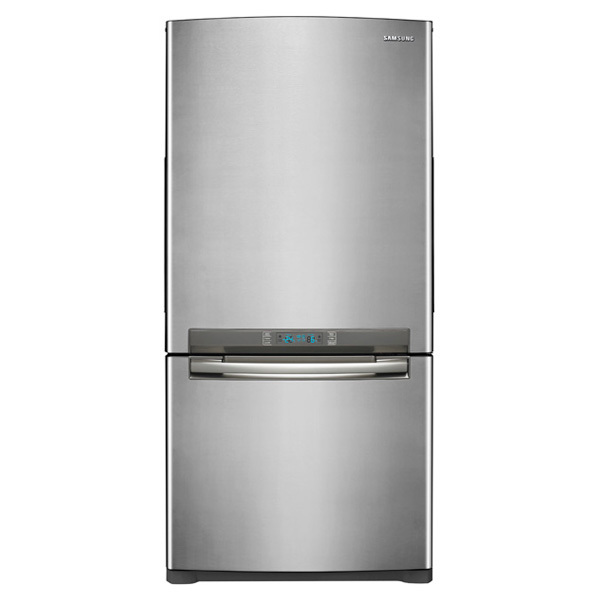 Appliances – We owned all but our dishwasher. Range: Samsung 30″ 5.9 Cu Ft Electric range with true convection oven and warming drawer (no longer sold) – in Stainless. At the time we needed an oven, the induction version of this oven had bad reviews because of the configuration of the top. I was not happy looking at it in person and even now, I’m not thrilled with the slide-ins available. We’ll go induction when this one goes south since gas would be incredibly expensive since we don’t have it and induction is the most efficient. We’ve been preparing by making sure all cookware going forward is compatible (boo hoo, means no copper All Clad now makes copper core for induction) I love the 20 minute steam clean cycle, the warming drawer is a lot more useful than expected and the warming center at the top is pretty sweet! I’m happy with all the features this has available.